Interactive Science Notebook - Coming Soon! Available now! Visit my store! 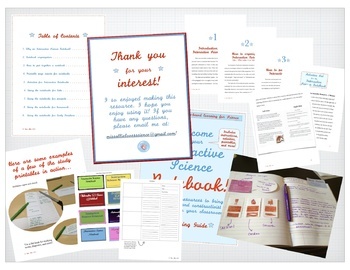 A super-thorough guide to creating and using Interactive Notebooks in the Middle School Science Classroom. This preview includes the first chapter and an example image of one a unit preview printable in action. This edition includes 1-2 activities for every week of the school year to use with your notebooks! I'm almost finished and I'm VERY excited to put this onto TPT - I've been working really hard on it! Look for it soon!